You were in an accident. You have back pain. Your doctor orders an MRI. She discovers degenerative disc disease. She tells you that you may have had this condition for years. You are shocked. You have never had back pain before. You want to know what this condition is and how will it affect my personal injury case? Will an insurance company offer less money because of this condition if I am in an accident? What if I never had neck or back pain prior to the accident? How does degenerative disc disease affect the value of my personal injury case? This article answers these questions and looks at the trial and settlement value of these cases. Before we can answer these questions, we must first take a look at the anatomy of the human spine. The human spine is comprised of 33 individual bones stacked one on top of the other. Ligaments and muscles connect the bones together and keep them aligned. Each vertebra in the spine is separated by a shock absorber called an intervertebral disc. The discs are comprised of two layers, the annulus, which is a tough fibrous outer layer, and the nucleus, a gel-filled layer with a high water content. When you move, the discs act like a ball bearing, with the outer layer providing stability and the inner layer allowing for the just the right amount of movement to allow you to stretch, bend over, and move from side to side. Behind each disc is an additional space surrounded by bone. This is where the spinal canal is located. The hollow spinal canal contains the thecal sac (housing of the spinal cord), the spinal cord, blood vessels, and exiting nerve roots which connect the brain and spinal cord to the extremities and other areas of the body. Given the very narrow space in which the spinal canal is located, it is critical that nothing compress or impinge the thecal sac, spinal cord, or exiting nerve root, as this would cause pain (sometimes severe pain radiating into the extremities). Each vertebra is connected in the back by four facet joints which allow for motion and stability. Degenerative disc disease occurs as a result of age or following a recovery from a traumatic injury. The condition occurs in essentially two different ways. The first is when the outer layer of the disc becomes cracked and rigid. When this occurs, the fluid in the inner nucleus may bulge out, compressing the thecal sac, spinal cord, or exiting nerve root. Often times this condition might appear on an MRI as bulging discs, usually at multiple levels. The second way degenerative disc disease can occur is with a loss of water molecules in the nucleus. 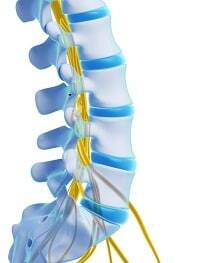 This reduces the space between the vertabra and puts additional pressure on the facet joints and the spinal cord. Over time, the body may compensate for this additional pressure by developing bone spurs that compress or impinge the spinal cord or exiting nerve. Value of your claim: how do insurance companies put a dollar figure on these cases? Degenerative disc disease can be diagnosed through x-ray or MRI. Usually, an x-ray will clearly show a loss of disc height between the vertebra as well as bone spurs. Both of these are tell-tale signs of degenerative disc disease. In addition, an MRI can show whether the soft tissue of the disc itself is impinging or compressing the spinal cord or the exiting nerve root. The severity of the disc disease determines how it is treated. It is possible to have degenerative disc disease and have no symptoms. This commonly occurs when the degeneration of the disc and narrowing spinal canal has not become severe enough to cause impingement, compression, or facet joint pain. When symptoms do occur, the condition is usually first treated with physical therapy, followed by trigger point or facet injections. If neither of those options work, surgery can be performed in the form of a microdiscectomy or a spinal fusion. It should be noted that if a bulging disc is the source of the back pain, a facet injection, which focuses on a different part of the spine, may have limited utility. It is not uncommon for a doctor to attempt facet injections following physical therapy, but for the patient to experience little or no relief. This is because the facet injections aren’t treating the true source of the pain, which is the bulging disc impinging the nerve. How Does the Condition Affect a Personal Injury Case? A common tale in the world of personal injury is a person gets into an accident, has back pain, and the doctor discovers degenerative disc disease after ordering an x-ray or MRI. The person usually never had back pain before. For the insurance company, this diagnosis is usually a dream come true. They now have something to point to other than the accident as the source of the pain. And on many occasions, they can successfully convince the jury this pain was due to a pre-existing condition (the degenerative disc disease). But this is only part of the story. In reality, there is much more going on here than just a pre-existing condition. While it is always true that a person could have pre-existing back pain due solely to degenerative disc disease, most of the time people do not experience back pain until after the accident has occurred. This is even more baffling when the person complains of severe back pain following a minor collision and the pain seems disproportionate to the intensity of the impact. To understand this, one needs to go back to the anatomy of the human spine. Just imagine a situation in which a person has age-related loss of water molecules in their disc. 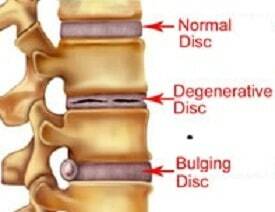 This causes narrowing of the disc space but no current compression on the spinal cord or the existing nerve root. The condition is there but it is not currently causing any pain. Taking it one step further, let’s say our hypothetical person gets into an auto accident with minor property damage. A few days later, they are in excruciating pain with radiation down their leg. The doctor orders an MRI and finds a bulging disc compressing the nerve root at the same level as the old degenerative disc disease. Now, is the person’s pain due to a pre-existing condition? The answer is “No. It is not.” The pre-existing condition was there, but that did not cause the pain. The accident caused the pain. The pre-existing condition merely made the person more susceptible to having the injury and pain. The effect that injury might have upon a particular person depends upon the susceptibility to injury of the plaintiff. In other words, the fact that the injury would have been less serious if inflicted upon another person should not affect the amount of damages to which the plaintiff may be entitled. Degenerative disc disease cases can be difficult to present to a jury. If you take one of these cases to trial without an experienced Maryland personal injury lawyer who knows these cases, you are making a huge mistake. Degenerative disc disease is like liquid courage for many claims adjusters, particularly before a lawsuit is filed. Unchallenged, an experienced defense attorney can easily distort the facts to make the jury believe the accident didn’t actually cause the injury (especially if low property damage is involved). It is imperative that your attorney works with your doctor (preferably an orthopedic surgeon) to help present your case in the most persuasive fashion possible. Often times, this comes down to explaining the anatomy. The jury has to understand that every person is different. We don’t live in a vacuum. Some people because of life, age, experiences, genetic differences, etc. are just more susceptible to injury than others. The differences have to be isolated and clarified for the jury. Once isolated, you will be in a better position to explain how the subsequent injury and pain occurred. Make no mistake the vast majority of these cases are winnable and they should be. But these claims have to be presented carefully. What to expect in a back injury insurance claim? The settlement value of degenerative disc injury cases are all over the map. We have settled preexisting disc injury cases for seven figures. We have also turned down many degenerative injury cases because we thought the claims had no value. Below are a few results and the stories behind them that might give you a better idea of the value of these cases under certain fact patterns. Obviously, you cannot use these examples alone to compute the settlement value of your claim. October 2014, Maryland: $50,000 Settlement. Plaintiff, a 33-year-old teacher and coach was broadsided in an intersection in Baltimore City when Defendant ran a red light. Plaintiff suffered a herniated disc and underwent a course of physical therapy as well as facet injections which offered little relief. Plaintiff resigned from his coaching position as he was unable to perform his duties due to the paint. Plaintiff filed suit against the Defendant driver, an Allstate insured. The defense contended that the Plaintiff’s pain was due to degenerative disc disease. The case settled for the policy limits of $50,000 the day before trial. Miller & Zois handled this case. May 2014: $11,900 Verdict. Plaintiff was stopped at a red light when he was rear-ended by the State Farm insured Defendant. Plaintiff claimed a cervical disc herniation for which future surgery was a possibility, and missed more than eight months of work. He filed suit seeking past and future medicals, lost wages, and damages for pain and suffering. The Defendant denied liability and contended that even if she had caused the accident, she merely tapped the rear of Plaintiff’s vehicle and could not have caused the serious injuries. Defendant further argued that the Plaintiff had significant spondylosis which was more than likely causing the ongoing complaints and need for surgery. While a Howard County jury found for the Plaintiff on the issue of liability, they clearly believed that Plaintiff had a pre-existing condition causing Plaintiff’s medical complaints. Plaintiff was awarded $11,900. The problem here is a preexisting injury and a very conservative county for personal injury awards. May 2014, 2013: $291,000 Verdict. Plaintiff hits our client in rear-ended in Frederick County, Maryland on a busy highway. State Farm does what we referenced above: they hear degenerative disc disease and they stuck their chest out, offering a measly $8,200. The jury heard the whole story, not just the preexisting injury story and send a message to State Farm (that they certainly forgot 20 minutes later). Miller & Zois handled this case. May 2014: $113,618 Verdict. Plaintiff, a 69-year-old retiree (and part-time horse trainer) was operating his vehicle on a rural road in Wicomico when he was struck in an intersection by an uninsured motorist. Plaintiff filed suit against the Defendant driver as well as State Farm, his UM carrier. Plaintiff sought treatment for lower back pain, with pain radiating into his left leg. He followed up with physical therapy and chiropractic treatment. He was assigned a 25% impairment rating and claimed he was no longer able to enjoy his post-retirement hobby of horse training. Defendants contended that he was not injured in the underlying accident and that any complaints were due to degenerative changes. Plaintiff argued that if he had degenerative changes, they were asymptomatic before the accident. A Wicomico jury sided with the Plaintiff and awarded him $113,618. Plaintiff had claimed $13,618 in past medicals. May 2013: $65,000 Verdict. Plaintiff, a 50-year-old generator repairman, was traveling on a rural road in Calvert County when he entered an intersection and was struck by a vehicle owned by a portable toilet and septic service business. The driver was in the course of employment at the time of the accident. Plaintiff claimed a cervical disc herniation and rotator cuff tear as a result of the accident, both of which he claimed surgery would be necessary. He filed suit against the driver and the driver’s employer. Defendants not only denied liability but further denied the extent of Plaintiff’s injuries. Defendant claimed Plaintiff had pre-existing degenerative disc disease, which was all unrelated to this accident. Plaintiff sought $8,600 in past medicals, $25,000 for future surgery, and future lost wages which would occur from the surgery and recovery period. A Calvert County jury awarded the Plaintiff $65,000 - $6,500 for past medicals; $23,000 for future medicals; $11,000 for future lost wages; and $24,500 for pain and suffering. If you have suffered an injury and you believe your injuries stem from a car accident or other trauma caused by the negligence of someone else, call us at 800-553-8082 or 410-779-4600 or get a free online case review.